"Union Station, we will be parked right by the National Postal Museum." Second time at Ball or Nothing - the meatballs are very decent, but it's the sides that steal the show. I would absolutely order a full lunch of the sides, and still have trouble deciding which ones to pick. Today I had the kale with ricotta and the roasted kabocha squash. The kale had a wonderful, smokiness to it with a fresh ricotta on top, and the squash was perfectly roasted. Again, the meatballs are very good, but the sides are the main event. One of my favorite trucks. Crew inside is always very friendly and the food is awesome. The meatballs a very good, but don't sleep on the sides. They can star as well! 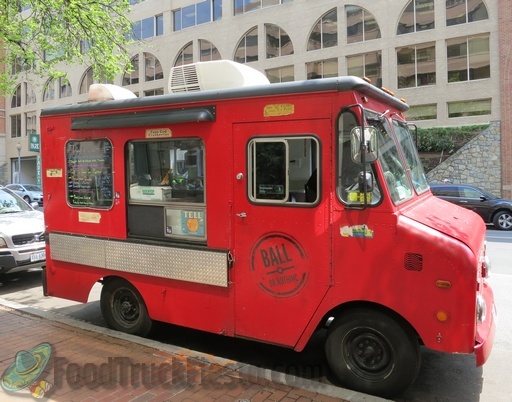 Maybe the best overall food truck in DC. Owners seem to be focusing on a new restaurant, so the truck unfortunately isn't out as frequently as it used to be. 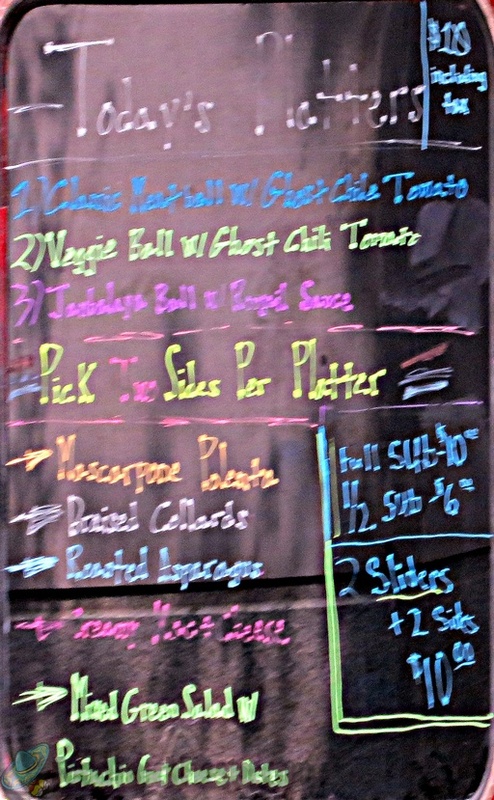 The veggie balls were very good and had quite a spicy kick which I appreciate. With the addition of the two sides; sea-salted heirloom tomatoes and mac & cheese the portion was fairly large so I am saving half of it for dinner, making it a pretty sweet deal! I was very excited to see this food truck back at West End today, it has been a while. I love this truck. It is not often anymore to find a truck in this area that tastes like the food came from an actual restaurant. You have to get the polenta with the meatballs, as it mixes so well. The salad on the side was scrumptious. The wait is a little long, but that was only because the line to order was very long. They worked well together to get the food out in a very reasonable time considering. I actually felt bad for the truck parked in front of this one. Because even with the crowd of people around this truck, I think I only saw one customer at the other truck. That says a lot about the quality of food from Ball or Nothing! Awesome Food! Loved it and so did everyone in the office. Nice Change of food on Capitol Hill. Ordered the Platter with @ Classic Meatballs and 1 BBQ Chicken Meatball. Classic were better but BBQ Chicken was great as well. You must do the Marscaopne Polenta, and got the roasted sweet potatoes, good as well. Hadn't been here in a while but I'm glad I stopped by. The bbq chicken meatballs were so flavorful and the Ball or Nothing guys added a flavorful, spicy sauce with chunks of mango that really put them over the top. The sides all sounded pretty good so it was tough to choose. The mac and cheese was excellent. One of the top trucks ! Never thought of the truck as Italian like the one reviewer, just a truck that serves Excellent Food. Meatballs can be made a million different ways...their way is very good with a very generous portion. These guys are excellent, the classic sauce is a GREAT contrast to the polenta and the roasted cauliflower was a tasty twist - just right. I've had their salads and these guys actually wash their salad, unlike some of the other lazy trucks. Very fresh and always good. Also, great customer interaction, quick service and VERY Consistent. OK...let me say first, I grew up in an Italian neighborhood in MA. I grew up eating and cooking Italian food and after 30 years in the kitchen cooking primarily Italian food, I'm pretty damned good at the basics--Meatballs being an aboslute must be able to do right to call yourself an Italian cook--This is NOT an Italian meatball! I can't tell you the level of disappointment. I had my hopes up after reading the reviews. They need a disclaimer sign to warn Italian food lovers that this is NOT even close. Texture...probably the most important characteristic of a good meatball; crisp on the outside, yet soft and delicate on the inside. These meatball were more a single, very soft and mushy texture as if they have been boiled in a stock or broth rather than seared on a pan then finished in the oven, then let to sit in sauce for at least an hour. Did I say they sucked! And the over-reliance on heat. Way to much heat...can't taste the spice through the heat. Even the sides had way too much heat. I love heat and this was way overdone. Heat should have purpose in flavor rather than just heat for heat sake. I wish the Indian or Mexican trucks would get this truck's heat level...because the Indian or Mexican spicing should convey heat, but, not out here for some reason. 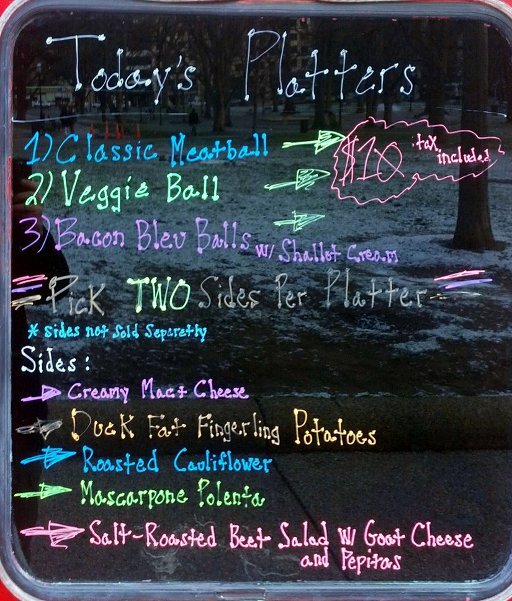 Ball or Nothing serves meatballs, of course. Menu items include veggie options and come in chicken and ghost chili varieties. They launched on April 17, 2012 in DC.